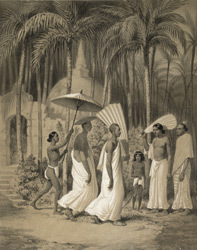 Lithograph of Singhalese Buddhist priests at Kandy in Sri Lanka, by L.H. de Rudder (1807-1881) after an original drawing by Prince Aleksandr Mikhailovich Saltuikov of May 1841, published in 1848. Kandy is the site of the Temple of the Tooth (Dalada Maligawa), the most venerated shrine on the island which contains an important Buddhist relic held within an inner sanctuary, a tooth from Buddha himself. Legend states that the tooth was snatched from the flames of the Buddha's funeral pyre in the 6th century BC. With the demise of a strong Buddhist kingdom in India, it was hidden in the hair of a princess and smuggled into Sri Lanka for safe-keeping in the 4th century AD. As the most important Buddhist relic on the island, it was moved to various capitals by successive kings until finally enshrined in Kandy in the 16th century. Little remains of the original shrine and the present structure mostly dates from the late 17th century. The relic is carried in procession in a casket on the back of an elephant during the famous Festival of the August Moon (Esala Perahara), accompanied by traditional dancers and chieftains wearing the regalia and dress of the ancient Kandyan Kings.